I have mixed feelings about Blonde Redhead. My first exposure to them was an earlier unfocused album borrowed from a friend. I didn't like it. Then i saw them in concert. They were mixed poorly, so that the female vocals and guitar were lost in the bass and drums. However -- what amazing bass and drums. I realized that they had one of the tightest rhythm sections i had ever seen. When Melody Of Certain Damaged Lemons came out, they began playing tracks on local college radio stations. There was that awesome rhythm that i remembered from their show, and now added were quaint little high-pitched girl vocals. I decided to give this a try. And after about three months, i still can't decide what to think. 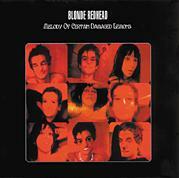 On the one hand, Blonde Redhead are capable of making some of the cachiest tunes i have ever heard. I dare you to try and keep your foot still while listening to In Particular or Ballad Of Lemons. You can't do it -- not without defying the laws of physics in some way i do not understand. On the other hand, well, vocalist Kazu Makino is really high-pitched. I bet she could shatter wine goblets with her voice if she tried. After a while, that just gets on my nerves. This is particularly so on Mother, which sounds as if someone is standing on her foot and she is screaming at them to move. It really gets on my nerves. So i dunno what to say. In small doses, this band is brilliant. However, you have to choose carefully or else you will wind up hating them. It's kind of hit-or-miss.